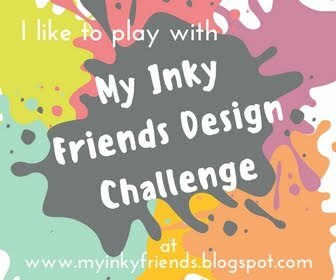 Today I’m hopping with my Inky Friends in the Love it. Live it. Share it Blog Hop! We all are showcasing different sets from the Occasions Catalog. I have the honor to be the first stop to kick things off. Make sure you go through and check out everyone’s blog. There are some fantastic projects out there. I am shining a spotlight on the Picture Perfect Birthday stamp set. This set also has a fantastic suite of products to go with it. So. Much. Fun. Are you ready for some inspiration? Let’s get started. First up I have a fun little treat box. I made a little 2-4-6-8 box, similar to the one here, out of the Foil Frenzy Specialty Designer Series Paper. Love the foil dots! I stamped the little tag, layered it on the Lemon Lime Twist banner and clipped it to the box with one of the Birthday Mini Binder Clips tied with a bit of Berry Burst Metallic-Edge Ribbon and piece of Bermuda Bay from the Sale-A-Bration Shimmer Ribbon Pack. A tiny rhinestone to add a little bling on the candle finishes it off. Next I have 3 different Birthday cards. First is a 3″x6″ greeting showing off the coordinating Picture Perfect Party Designer Series Paper. I love the realistic photo quality images in this stack. I used the candles for this one. Stamped the sentiment right on the DSP and layered it on striped pattern also form the stack. I stamped the bow in Pool Party on the card base and used Bermuda Bay stamped off for the little shadow details. A Lemon Lime Twist In Color Bitty Bow is the finishing touch. This next card also features the Picture Perfect Party DSP stack. I have to give credit to Mercedes Weber for the polaroid idea. The photo realistic paper is perfect for this. I used the Layering Squares Framelits to cut out the polaroid frames. Stamped Happy Birthday in Bermuda Bay, Lemon Lime Twist and Berry Burst and layered the dsp images behind. It is hard to see, but the Basic Black card base is embossed with the Polka Dot Basics Embossing Folder. I finished off the card with some rhinestones and Lemon Lime Twist 3/8″ Mini Striped Ribbon. My last project is another Birthday card, but this one let’s the Stamp set take center stage. I started with a 3.5″x5.5″ Crumb Cake card base. I added a layer of the Wood Textures DSP and a Berry Burst panel layered on the striped piece from the dsp stack. I used the large Happy Birthday from Perennial Birthday stamp set to create the background for the white heat embossed “Celebrate the Good Stuff” greeting from the Picture Perfect Birthday set. I stamped and cut out the candle, bow and noisemaker. The present is one of the patterns in the DSP stack. two Pool Party strips create the “ribbon” around the gift. I really like the Wood Texture DSP as the background for this. Hope you are inspired to create some Birthday fun with the Picture Perfect Birthday set! Thanks for hopping by! Next up on the hop is the amazing Sarah Wills. She is featuring the fabulous Picnic With You set. Happy Stamping! Wow! Mary, what a wonderful grouping of projects showcasing this stamp set. I love your little treat bag. Too cute. And your cards are wonderful. Thanks for sharing your creativity with us! WOW! All your projects are beautiful. I love them all, hard to pick a favorite. I’ve been seeing more of this suite, and it is really growing on me. I love your combination of photographic images and stamped sentiments. Magazine quality result. Great job! Great projects, Mary! That polaroid card is amazing! And I love the tall candle card. These are cute. Love the Polaroid frames the most! Holy cow, these are all AWESOME! Love the little details like the rhinestone on the candle, and the multi-stamped happy birthday with the greeting heat embossed over. My fave is the Polaroid card, though…..just perfect! Mary, these are wonderful projects! I especially love the polaroid “photos” card. How fun! Terrific projects! I’m not even sure which is my favorite. They are all wonderful! I love your bright and gorgeous designs!! SO creative!! Fantastic! Oh my!! Great projects, my favorite is the photo card !!! Thanks for casing this card and sharing all your creativity with us !!! Center Stage Stamping reflects my passion for paper crafting, theatre and inspiring creativity. This site is not affiliated or endorsed by Stampin’ Up! As an Independent Stampin’ Up! demonstrator, content including images and copy are copyrighted, so please do not use without permission. Center Stage Stamping is here to put a spotlight on creativity and hopes to inspire you to unleash yours! © Copyright Center Stage Stamping 2019.